Orbit sugar-free gum contains Sorbitol, Maltitol and Xylitol, all three of which are high FODMAP. If you like to chew gum, you need to be careful while on the low FODMAP diet. The problem is that many gum makers use sweeteners that aren’t sugar so they can label their gum “sugar-free”. However, the sweeteners they use are often not allowed under the low FODMAP diet. In fact, even people who aren’t on the diet should think twice before chewing some of these sugar-free gums. Have you ever seen a warning message on a pack of gum that says it might have a laxative effect? That’s because of the sweeteners in them. And while it might be OK in small quantities for people not on the low FODMAP diet, FODMAPpers need to be careful. Some of the sweeteners used in sugar-free gum are Sorbitol, Xylitol and Mannitol. These are polyols–the “P” in FODMAP. They are also commonly found in some fruits. 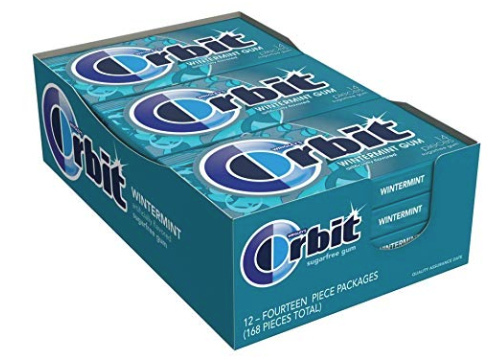 If you search the gum selection in the checkout aisle (and I have!) you will be disappointed to find that almost all gums sold these days are sugar-free and contain one of these sweeteners. At my grocery store, the only gums I can find that has sugar instead of these other sweeteners are from Wrigley’s, including Wrigley’s Spearmint gum. The other ingredients in this gum also appear to be safe.